Phnom Penh (VNA) – Vietnamese Prime Minister Nguyen Xuan Phuc and his Cambodian counterpart Samdech Techo Hun Sen agreed on various measures to bolster the countries’ multi-faceted relations at their talks in Phnom Penh on April 25. PM Hun Sen considered the Vietnamese leader’s official visit as having historical significance amid the 50th anniversary of diplomatic ties, voicing his belief that the trip will provide a strong momentum for their traditional friendship and comprehensive cooperation to thrive. He spoke highly of Vietnamese investors’ contributions to his country, noting that the military-run telecom group Viettel, the Vietnam Rubber Group, the Electricity of Vietnam Group (EVN) and other businesses of Vietnam have run profitably and fully paid taxes to the Cambodian Government. Notably, Metfone-Viettel has paid 400 million USD in taxes over the last decade. They have also contributed to socio-economic development and the care for local people’s material and spiritual life, especially low-income earners and rural residents, he added. The two PMs agreed to continue promoting trade, services and cooperation between Vietnamese and Cambodian localities, particularly the ones located along the shared borderline. They said locality-to-locality ties have proved fruitful in the spirit of friendship neighbourliness and comprehensive cooperation. They will order the joint committee for border demarcation and land border marker planting to step up negotiations, seek solutions regarding border sections not demarcated, and work closely in border management, thereby enhancing peace, stability, cooperation and sustainable development along the shared border. At the talks, the Government leaders valued the outcomes of mutual visits by the countries’ senior leaders and agreed to increase delegation exchanges at all levels. They vowed to facilitate and seek effective measures to boost partnership in potential areas such as trade-investment, banking, electricity, mining, oil and gas, industrial tree planting, transport, telecommunications, and education-training. 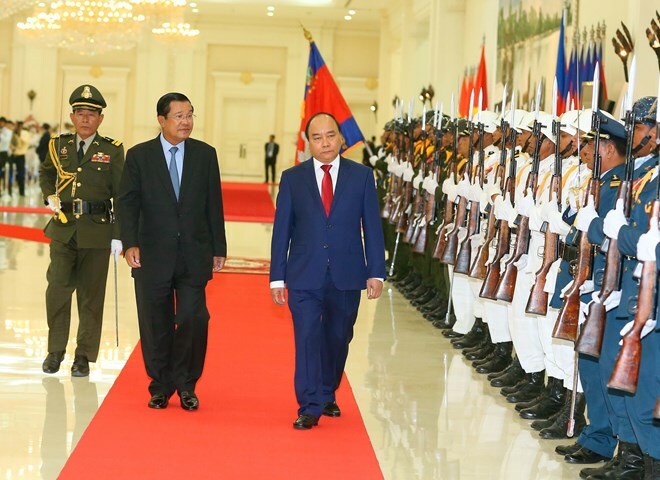 Vietnam and Cambodia will keep close cooperation in security and defence, they said, reiterating the principle of not allowing any hostile forces to use the territory of this country to sabotage the other’s security and the two countries’ friendship and cooperation. Both sides are set to enhance collaboration to fight terrorism, transnational crimes, smuggling, drug crime and human trafficking. They will also press ahead with the search for and repatriation of the remains of Vietnam’s volunteer soldiers who sacrificed their lives in wars in Cambodia, the PMs added. At the meeting, they discussed stepping up connections within the framework of ASEAN and the Greater Mekong Subregion. They also exchanged views on international issues of shared concern. On this occasion, PM Phuc appreciated Cambodia’s provision of good conditions for Vietnamese expatriates, asking the country to take appropriate measures to soon recognise their legal status and Cambodian nationality. He also called on Cambodia to recognise schools managed by Vietnamese-Cambodians there as part of the country’s education system. In response, PM Hun Sen promised to direct relevant agencies of Cambodia to provide fabourable conditions for Vietnamese-Cambodians to be treated as equally as expatriates of other countries. Following the meeting, the two PMs witnessed the signing of cooperation documents. Vietnam’s Transport Ministry and Cambodia’s Ministry of Public Works and Transport signed a memorandum of understanding (MoU) on cooperation on promoting the study of the construction of Ho Chi Minh City-Moc Bai and Phnom Penh-Ba Vet expressways. Another MoU on building a voluntary rehabilitation centre for drug addicts in Preah Sihanouk province was inked between Vietnam’s Ministry of Labour, Invalids and Social Affairs and Cambodia’s Ministry of Social Affairs, Veterans and Youth Rehabilitation. The Directorate of Fisheries under the Vietnamese Ministry of Agriculture and Rural Development and the Fisheries General Department under the Cambodian Ministry of Agriculture, Forestry and Fisheries signed an official letter discussing the extension of the MoU on fishery cooperation for another three years. Meanwhile, the administrations of Hanoi and Phnom Penh signed a MoU on the assistance to the construction of a Phnom Penh-Hanoi friendship avenue.